From the capital area of Muscat, the region stretches along the coast eastwards towards Quriyat. Westwards and inland the boundary ends at Rusayl, at the foothills of the mountains. The region has much to offer in terms of natural beauty, pristine sandy beaches, rugged mountains and wadis. Coastal waters teem with aquatic life. Muscat reflects its rich history and culture, together with a beautiful and modern face of a well planned city with all the amenities to be expected but where the old harmonises with the new. 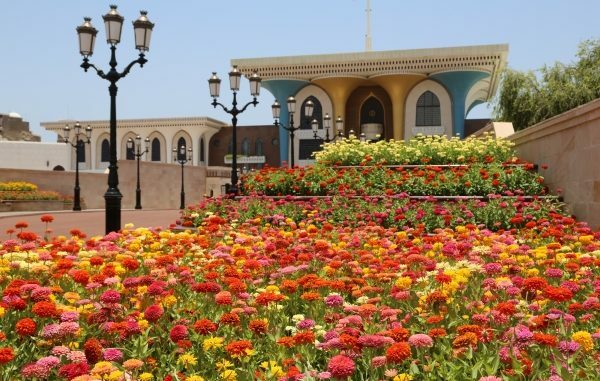 Many nationalities inhabit Muscat, creating a vibrant and cosmopolitan atmosphere. It has an excellent road system, good hotels, restaurants, shops, leisure and sports facilities, museums, parks and the city is exceptionally clean. Muscat is also the home of His Majesty Sultan Qaboos Bin Said, and his magnificent palace ‘Al Alam’, is flanked by the majestic forts of Jalali and Mirani, outstanding landmarks of the past. The natural beauty and strategic location of the harbour, sheltered by the mountains on three sides, is fascinating. The bustling modern port of Muttrah is the busiest harbour in the Muscat region. The Fish Souq and Souq Al Dhalam – “Souq of Shades” – provide a true Arabian experience. Muscat is described as the “jewel of Arabia” – where one will experience all the delights of Arabia and you can enjoy several adventures and activities like dolphin watching in Muscat or jet skiing in Muscat. This region links Muscat and the coast with the Interior region via the Sumail gap, which forms a natural break in the Hajar mountain range (the “backbone” of the country) dividing it into Eastern and Western Hajar, from which Jebel Al Akhdar (“the Green Mountain) soars to a magnificent 3,000 metres. A major trading route for centuries, the Sumail gap is lined with a multitude of forts and watchtowers. At the western foothills of the Hajar lie the historic towns of Nizwa and Bahla. The region stretches south to the fringes of the desert. Nizwa, the administrative centre of Dakhiliya, developed alongside the course of two wadis (rivers) from which Aflaj (water canals) run through all parts of the area for irrigation and domestic purposes. Bahla has retained its traditional characteristics – the old souq continues to thrive and old workshops still produce the excellent pottery work for which Bahla is famous. At Izki, one of the ancient cities, archaic landmarks bear witness to its long history. The region has its share of myths and legends that have been passed on orally for generations. With its mountains, gorges, wadis, forts and castles, amazingly quaint villages, various handicrafts, endless date plantations and colourful history – a host of sights and experiences awaits the visitor to Dakhiliya. Hotel accommodation is very good, and restaurants serve typical Omani fare. Shop at modern facilities and traditional souqs specialising in traditional silver jewellery, copper and weavings. A happy mixture of old and new awaits you.